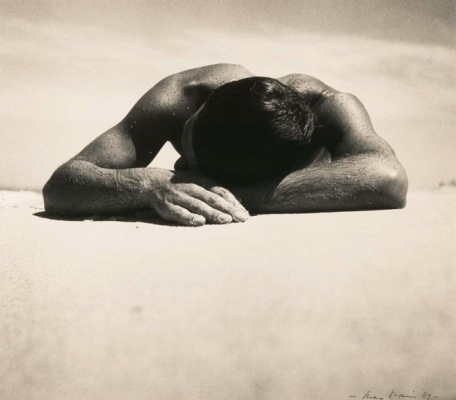 Dupain is one of Australia's most famous photographers. He is represented in NSW, Victoria and South Australian State Gallery collections and in the National Collection. He distinguished himself in all areas of photography from portrait and fashion to industrial and architectural. He is recognised as one of the world's great documentary photographers and in 1982 was awarded a Companion of the Order of Australia. Dupain studied art at East Sydney Technical College and at the Julian Ashton School. Initially he worked for three years in the commercial studios of Cecil Bostock before opening his own studio on a share basis with other photographers, including Reg Johnson. Throughout his career he photographed for major corporate companies and Government departments concentrating in the latter part of his life on architectural studies. Dupain was one of the first Australian photographers to use the aesthetic termed the "New Photography" or "New Objectivity" which originated in Germany in the mid to late twenties. This aesthetic aimed to express, confront and integrate the industrialised societies that had developed so rapidly in the twenties. New Objectivity explored different uses of the new cameras, experimenting with different perspective's, bird's-eye views and close-ups. The images were like fragments of a film, unsentimental and impersonal, expressing existing relationships but often from enlightening angles. Dupain's work led directly forward from the more Pictorialist representation of Harold Cazneaux where a graceful line and soft focus were cherished. "It would be difficult to find a Dupain photograph which did not instantly reveal the reason for taking it. "^ He penetrates the subject inviting the participation of the viewer. Unlike younger photographers who question our sense of understanding by focussing on the ambiguous edges of our world, he confronts by using the everyday. A lot of Dupain's photographs include people. Examination of the personality occupied a great deal of his productive life. The earlier portraits carry the "Dupain stamp" and in that appear more constructed than the latter portraits which appear to be taken more with a child's eye allowing the photographed to appear more in control of expressive.